An American-style shopping centre on the outskirts of Copenhagen - Fields - has now created specific bicycle parking for cargo bikes. With 40,000 cargo bikes in Copenhagen, it really is a no brainer. Architect Lasse Schelde, head of the Bicycle Innovation Lab and environmental NGO Miljøpunkt Amager was responsible for this little pocket of visionaryness. I know that's not a word. Well, maybe it is now. Great to see cargo bikes prioritised, not least because so many people use them. 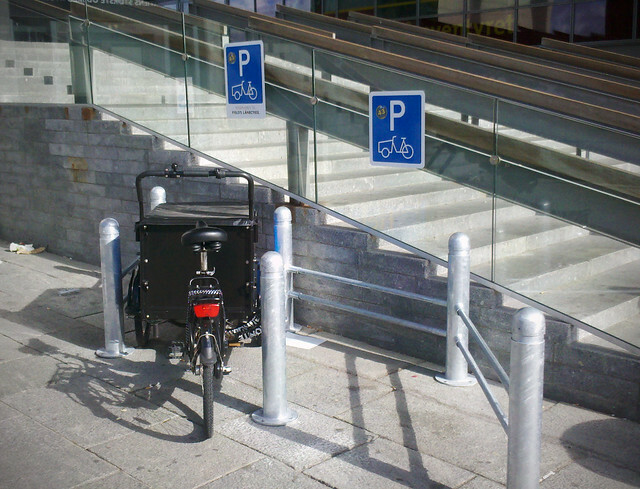 And a sensible solution, too, with railings to lock your bike to. Copenhagenize Consulting is working on similar projects with our Cyclelogistics EU project.